We already have FAQs on UniDesk Self-Service Portal, which we add to regularly. You can access these from UniDesk Self-Service from the Portal. 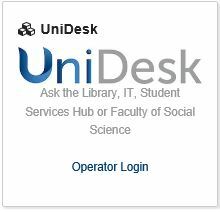 Within UniDesk there are a number of tiles, to access all of the FAQs for the service areas who use UniDesk please click on the FAQs tile. Stirling VPN – remote access to network folders. SensusAccess – make accessible documents. SPSS 25 for Windows – Installation instructions. SPSS 25 for Mac – Installation instructions. Add the studen tprinter queue to your Mac. Print from your own laptop to the student print system. Minitab 18 for Windows – Installation on your personal computer. Accessing network folders from off campus. There are many more FAQs available. The FAQs section is broken down into sections for the different service areas who use UniDesk. Within each of these areas the information is broken down by topic to make it easier to find what you are looking for. From the UniDesk Self-Service Portal homepage, you can access the different services by their individual tiles. You can also contact us or see any requests or faults you have reported to any of the service areas. On this homepage we also put in any news items or notify users of any major incidents. If you are struggling to find what you are looking for you can always use the powerful search engine at the top of the page this searches through all of the information on the Self-Service Portal.